When California legalized recreational marijuana use in 2016, Gene Grozovskiy decided he would show tourists the big change behind the scenes. Now he's seeing some green, thanks to strong interest in all that grass in Los Angeles, considered the world's largest pot market where the air routinely smells of weed. The 35-year-old took inspiration from his father, a Russian immigrant who led tours of Los Angeles for decades. The younger Grozovskiy outfitted a bus to take visitors on pot-themed outings. But he acknowledged that getting Green Tours off the ground has not been easy. 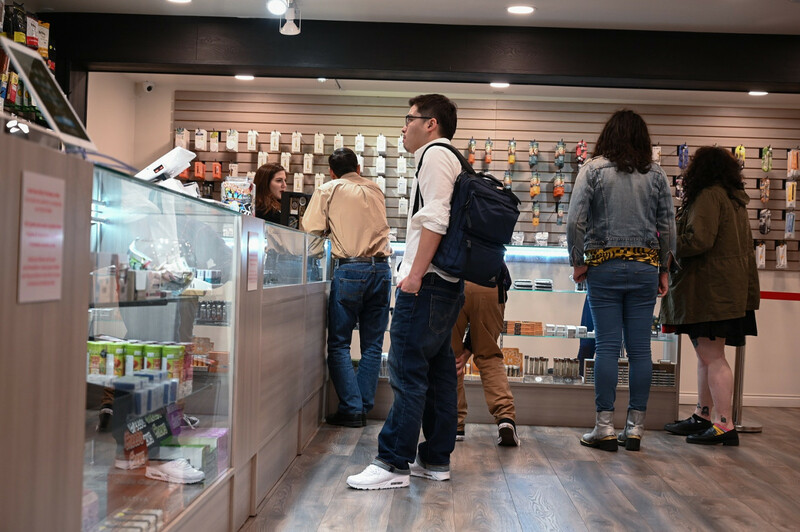 It's the same complaint heard from many with pot-related businesses in California: while dreaming of big money, what they have encountered is plenty of bureaucracy and high taxes from the state. "At first, the cannabis industry did not accept us, the tourism industry did not accept us," said Grozovskiy. "It took a year of literally knocking on doors and fighting," he explained. The company lost money in 2018 but expects to be in the black this year. Rivals, such as Green Line Trips, Weedology, Dope Tours and Food High, cropped up over the first few months after recreational pot use was legalized. Grozovskiy's tour takes about four hours and includes a visit to a dispensary -- selling not only weed but also candies, chocolate and other edibles -- a local growing facility, a bong factory and a house for smoking. It costs $89. Rather than typical Hollywood tour stops, Grozovskiy's bus will take patrons to experiences like a smoking session with actor Tommy Chong from "That'70's Show," for $179. In the future, he hopes to bring other celebrities on board, like Snoop Dogg. Guide Ryan Lance told the story of cannabis: how it was first used as medicine in the United States before being outlawed. Now, its recreational use is legal in 10 US states, including California, and in the capital Washington. Among the major changes since legalization, marijuana-linked arrests have declined sharply -- down from millions in recent decades. In the dispensary, manager Scott B, who wouldn't give his last name, detailed the various types of marijuana plants that exist. He also described how to differentiate female from male plants, how they are crossed, and the light and water the plants need to thrive. The manager detailed worrisome state taxes, strict tests that can lead to millions of dollars in weed being discarded and how some companies employ five-year-old children to test the safety of their packaging. "I think any time you're interested in something, and anytime you can see the behind-the-scene aspect of that, it's always fun," he said. "I mean you see it at Disneyland, you see it here in Hollywood, why not for cannabis, you know?" Legalization was critical to launch pot-related tourism ventures. And yet the overall marijuana industry has not surged as many predicted. "The decline is slight, but remarkable given that we projected a very rapid growth," said Arcview vice president David Abernathy. California's pot legalization means that anyone over the age of 21 -- as for alcohol -- can have up to one ounce (28.3 grams) of grass. Meanwhile, producers, distributors and sellers must apply for city and state licenses, and adapt their products to meet tough legal requirements. The measures have led to a "very developed and robust illicit market" of businesses that won't comply with the new law and can thus avoid charging astronomical taxes that can reach 35 percent, said Abernathy. Alex Traverso, head of communications at the California Bureau of Cannabis Control responsible for regulating the industry, told AFP that several measures will be approved in the state legislature that may reduce the tough current regulations. But anyway, the impact of the high prices was so great that Felicia Davis, who was on the tour, said she would not vote for a similar legalization in Wisconsin, where she lives. She prefers to pay less on the black market. "I have my connections," she said with a smile.